The oven features a very well defined adjustable effect, an accurate temperature control, a well ventilated chamber, and three different timing modes for running the unit. Our temperature control not only prevents the tissue in the chamber from becoming denatured (by high temperature) but it also assists in pulsing the microwave effect in small precise portions. The temperature control has a direct effect on the magnetron (the microwave generator) as it allows the unit to switch on and off in the most efficient way at the preset effect level. The set effect is adjustable at any time either before or during a run. This aids in the balance of the microwave load and the content of the microwave absorber. It should be noted that the penetration rate and process times are influenced by the presence of microwave radiation in the chamber and for this reason it is imperative that the effect rate be adjustable at any given time during a run. Inside the chamber there is a manifold for up to 5 tubes which allows you to achieve bubble mixing in from 1-5 containers at once. There is a built in air pump that facilitates the mixing, avoiding temperature gradients in the mixing process. These adjustable bubble mixers make the EMS-820 ideal for decalcification. minutes with or without turntable. Timed run: up to 99 minutes. The oven chamber is made entirely of stainless steel and it is very easy to clean. It is extremely resistant to all staining solutions that are usually employed in histology and like fields. The floor of the unit, which covers the rotator cavity, is a glass fiber reinforced silicone plate which serves as a thermal insulator and will not absorb microwaves. The plate is totally chemical resistant. The EMS-820 is designed for easy operation and maintenance. All of the controls can be set with one hand and are easily accessible allowing for changes at any time. An adjustable thermal probe encased in a white "PTFE" holder (a microwave transparent material) comes with the unit. The probe can be set at different heights to accommodate all different types of containers and volumes of liquid. Attached to the probe is an adaptor to hold one of the mixing tubes; this is important because the liquid which is regulated by the thermostat needs to be mixed well to avoid temperature gradients. The probe automatically measures the existing temperature and displays it. The unit has a built in reflector inside the chamber which evenly distributes the microwaves. A rotator is built into the unit, as well, to prevent "Hot-Spots" from forming even for very small volumes (e.g. ; reagent drops on glass slides). 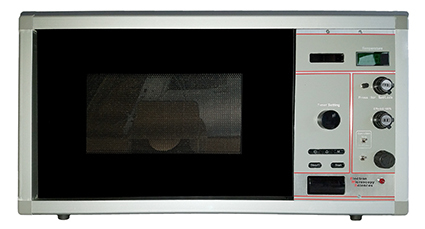 When using a laboratory microwave oven, one has to determine the set effect to use depending on the type of sample, temperature, and load. Our unit has the effect control knob easily accessible at all times, and can be changed even during the middle of a run. The effect percentage setting is easy to read at all times. Continuous Run Mode: For longer procedures (greater than 99 minutes 99 seconds) our unit runs continuously - the timer works in a count up mode for an indefinite period of time. There is no need to shut off the unit and begin again. A 5-port manifold for mixing up to 5 different containers at once. Very easy to clean and resistant to staining or scratching. Resistant to all staining solutions. It will accommodate any size container and it is flexible and very easy to align. It comes standard with the unit and it covers the rotator when it is not in use. Our unit has a built in powerful fan which accommodates at least 2 meters of tubing.